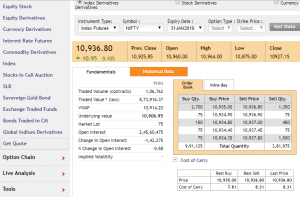 Sandip Raichura January 19, 2019 January 25, 2019 No Comments on Cost of Carry : Trading Smart! Our previous few blogs have talked about different kinds of spread trade strategies. This time we talk about a spread trade based around Cost of Carry (CoC). CoC is the difference between the futures and spot price of a stock or index. Theoretically, the cost of carry (basis) is simply the net cost of holding a position but has great information value for traders and strategists. Mathematically speaking, Cost of carry (COC) is the annualized interest percentage cost for a futures contract versus a similar position in cash market and carried to maturity of the futures contract, less any dividend expected till the expiry of the contract. Imagine you had to buy a commodity and store this for future delivery for a commitment you made- wouldn’t you charge the buyer at least the interest cost for one month applied to the cost of purchasing the commodity today plus some warehousing and other incidental costs? In pure financial derivatives like equity FNO, warehousing etc is irrelevant and one only treats the difference as finance costs. Note that the real-time CoC values are available on stock exchange websites (see bottomright on this image from the NSE site). Analysts typically consider the Cost of Carry as extremely important because the higher the value of CoC, higher is the apparent willingness of the traders to pay more money for holding futures. This is called a “Contango” – positive cost of carry. The opposite is true for falling cost of carry. Sometimes, futures trade at a discount to the price of the underlying, which makes the cost of carry negative (called Backwardation). This usually happens when the stock is expected to pay a dividend, or when traders expect bearishness. Ignoring the impact of dividend, there are two elements to the cost of carry : The fair or theoretical COC and the actual COC observed. In other words, calculating the fair price of a futures contract versus the actual value observed may yield useful information to traders. Here, Rs 6 is the theoretical or fair cost of carry. So the futures contract should be trading around this value of Rs 1006. Now what if instead the futures contract is trading at a drastically different price? Let’s say 1025? Clearly there is a trade here. As can be seen above, the difference between the spot and futures should ideally be just 6 points, but due to market imbalances the difference has shot up to 25 points. This is a spread that we can capture by deploying a trade. The thumb rule in any sort of ‘spread trade’ is to buy the cheaper asset and sell the expensive one.Since the futures price on our example is more expensive than it should be (or the spot price is much cheaper than it should be), one may do an arbitrage between cash and futures here as the imputed rate of interest is much higher than the actual cost of borrowing. The trade would simply be Buy Spot and Sell Futures and around the last days of expiry, squareoff this trade. We know that on the expiry day, both the spot and the futures converge into close to one single price and therefore a riskless profit may be earned. The other way to use this information is deciding which instrument to buy. Imagine a bullish trader has two options – a) Buy a stock with cash paying lets say 6% (the risk free rate at which he can borrow) on the borrowed amount and b) buying a futures contract at current market prices of 1025. To The trader would want to buy the cheaper instrument. To understand what is cheaper, he would then work out the “fair price” of the futures contract – using 6% above as the rate. If the fair price of the futures contract is lower than the actual price, as in our case, it means the futures price is more expensive than it should be – and therefore buying the stock and paying interest on it is better than buying the futures contract. Higher values of cost of carry along with the build-up of open interest indicates that traders are bullish and willing to pay more for holding futures. For a rising OI, an increase in CoC indicates accumulation of long(or bullish) positions, while an accompanied fall in the CoC indicates addition of short positions and bearishness. Likewise, a fall in OI accompanied with a rise in CoC, indicates closure of short positions A falling both OI and CoC indicates that traders are closing long positions. As is visible, the current month futures contract is trading way above its expected theoretical fair value while the mid month contract is trading close to its actual fair value estimate. One may therefore, irrespective of what happens to the actual market conditions, assume (rightly so) that the current month contract’s basis will eventually narrow down and the mid month contract will continue to trade close to its fair value. In this scenario, it therefore makes sense to sell the expensive contract (Current Month) and buy the relatively cheaper one (Mid Month). The spread locked in this case is Rs 11 (1025-1014). Remember that the trade’s profit is finally post brokerage, STT etc and therefore the trade should be taken only after the final profit makes sense- the above is just a theoretical explanation of the concept. Of course, do recall the critical assumption we have made here is that i.e. the mid month contract will stick to around its fair value which in some cases may not happen due to unanticipated impact on only one of the months and not both- although this is very rare, it does make sense to put a stop loss on this trade just to be sure that the trade doesn’t get disturbed. Do note that because you are buying and selling the same underlying futures of different expiries (called Intra Commodity Spread in the language of the exchanges), the margins are greatly reduced as this is a hedged position. One’s objective is therefore to make the most one can (Capture COC) on this reduced margin amount.